If you like cosmetic items, let us guide you. Apex Legends is a free-to-play game with microtransactions. That means developer Respawn and publisher EA Games earn money when players buy items that aren’t needed to run the game or have its full experience. 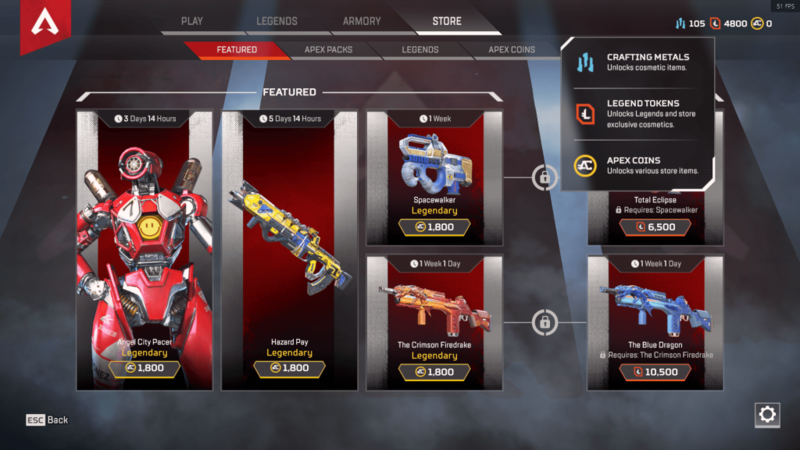 But if you’re a player who loves to have that shiny character outfit or exclusive weapon skin, you’ll need to first understand what the three currencies available in Apex Legends are, how to get them, and what you can buy with each one. Crafting Metal – Can only be obtained from Apex Packs, which means they can’t be bought with real money. They allow players to craft cosmetic several cosmetic items, from Common intros for 30 Crafting Metal to Legendary skins for 1,200. Legend Tokens – Can only be obtained by leveling up your account, which means they can’t be bought with real money. Players can use them to unlock new Legends and Legend Token-exclusive skins from the Store. Apex Coins – The currency you can only buy with real money. You can use them to buy featured items in the Store, new Legends, and Apex Packs. 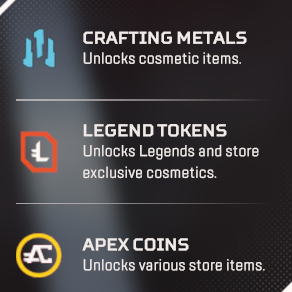 It’s impossible to buy cosmetic items directly with Apex Coins, except for those featured in the Store. None of these currencies expire. In the case of Crafting Metal and Legend Tokens, it’s as simple as their description. You can spend them on something you want and then they’re gone. Apex Coins allow for more interesting options since they’re the premium currency in Apex Legends. The least players can buy is 1,000 Apex Coins for $9.99, which is enough to buy a Legend for 750 and get 250 to spare. Players who buy more Apex Coins get bonuses, like spending $19.99 for 2,000 coins and 150 bonus, 4,000 for $39.00 and 350 bonus, and so on. Once players buy Apex Coins, they can spend them as they in the Store. Anything on that tab can be purchased with these coins. The Featured tab shows cosmetic items that can be purchased with Apex Coins for a limited time. There’s a countdown on top of the window showing how long the items will stay there. When the countdown reaches zero, new items will replace the old ones, and players will have to wait for them to get back to the rotation to buy them with Apex Coins. They continue to be available to buy with Crafting Metal, though. The only items in the Featured tab that are impossible to get otherwise are the ones on the Exclusive column on the right. They require the player to have the cosmetic item they’re tied to, indicated by the lock connecting it to that item. These can only be bought with Legend Tokens. Apex Packs are your regular loot boxes. It’s pretty much like gambling: You spend 100 Apex Coins to buy a pack that contains three random cosmetic items of random rarities. You have a 100 percent chance of receiving at least one item that’s Rare or better, a 24.8 percent chance of receiving an Epic item or better, and a 7.4 percent chance of receiving a Legendary item. 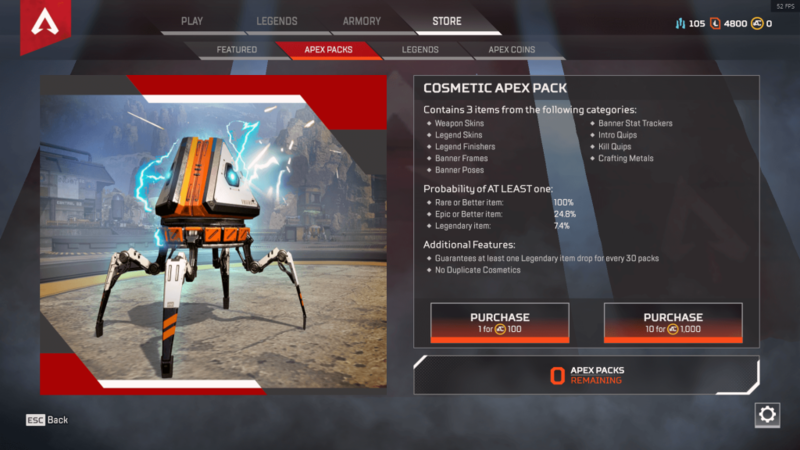 You’ll never receive duplicate cosmetics, and you’re guaranteed a Legendary item every 30 Apex Packs at most. If you already own all items of a certain rarity, you’ll receive Crafting Metal of that same rarity when you open items of that category. You also get Apex Packs when you level up. Legends are the characters you can use to play Apex Legends. You can either level up and save Legend Tokens to buy them without spending real money, or skip the grinding and buy them with Apex Coins. This is how microtransactions work in Apex Legends. If you prefer to play the game without spending a penny, you probably noticed you’re good to go anyway. If you like to build collections of cosmetics, you better get ready to spend some money.